Bro Harold is quite an artist and always has been. I have drawings of his filed away that I have saved over the years. (Some even he doesn’t know about.) When we were kids he used to sketch and draw constantly and was very good even then. Me – I couldn’t make two lines meet if I held a gun on them, but have basket just always loved what he could do with a pencil and a blank sheet of paper. He would always draw at his desk in his office while he was on a phone call. (I think it was unconscious therapy.) Many evenings I would stop in his office on the way out and pick pictures out of his waste paper for keepsakes. He would hang me by my heels if I printed any of them with this blog. But anyway, on to the purpose of this story. Harold was always a big fan of the comic strips when we were growing up. He could recite them all to you and tell you the artist who drew them. BLONDIE – Chic Young. BEETLE BAILY – Mort Walker. SNUFFY SMITH – Fred Lasswell. And on and on. He got his little brother hooked and I joined in on his fascination with the art even though I had zero talent in that area. 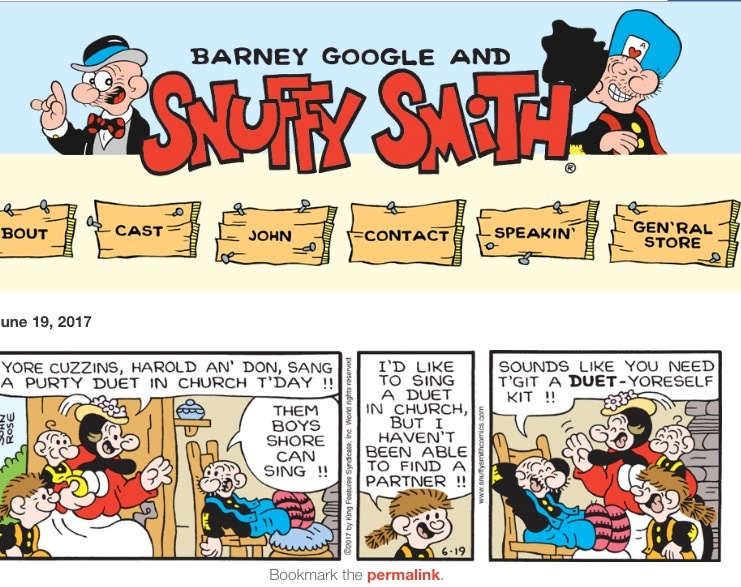 Some years ago, John Rose, a young artist, caught the eye of Laswell and understudied with him and now John is the full-fledged writer and illustrator of the SNUFFY SMITH daily and weekly strip and numerous books. John lives and works in Harrisonburg, VA just about 30 miles down the road from Staunton. Harold and I consider John a good friend and he has been a fan of our music through the years, so we have formed a little mutual admiration society and we often lunch together and always have a great time when we do. About a week ago, I was sitting in my easy chair in my den reading my two daily newspapers (5-a-day if you count the 3 I read online) when I get to my still-favorite page of comic strips and there we were being crowned honorary ‘cuzzins’ of the irascible-but-loveable Snuffy Smith himself. A tip of the hat to our buddy and bodacious friend, John Rose.